Fred. Olsen's Braemar is seen here in beautiful Flåm, Norway. Photo courtesy of Fred. Olsen Cruises. Braemar is Fred. Olsen’s second-largest vessel, capable of holding just 929 guests. At 642 feet in length and 73 feet in width, she boasts all the amenities of a vessel twice her size but with the intimate, relaxing atmosphere of a much smaller ship. Originally built in 1993, Braemar has sailed for Fred. Olsen since 2001. In 2008, she underwent an extensive refit that saw the addition of a new, 102-foot long midsection. When she emerged from the Blohm + Voss shipyard in Hamburg, Germany, she sported a number of new features including new balcony staterooms and suites, a new forward-facing observation lounge, and a dedicated Arts & Crafts room where the line’s onboard Arts Club programs are held. 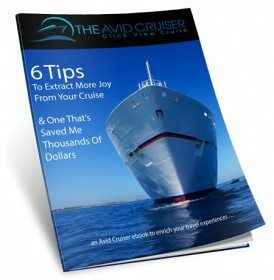 Stateroom choices are numerous and range from comfortable inside cabins to a spacious 300-square foot suite just aft of the navigation bridge. The ship also offers special inside, outside and balcony staterooms specifically designed for the solo traveler. These “Single” accommodations are extremely rare in the cruise industry (only Norwegian Epic and P&O’s Azura offer similar accommodations), and make Braemar a good choice for those looking to get away on their own without paying an extra supplement. The Morning Light Pub aboard Fred. Olsen's Braemar. Photo courtesy of Fred. Olsen Cruises. 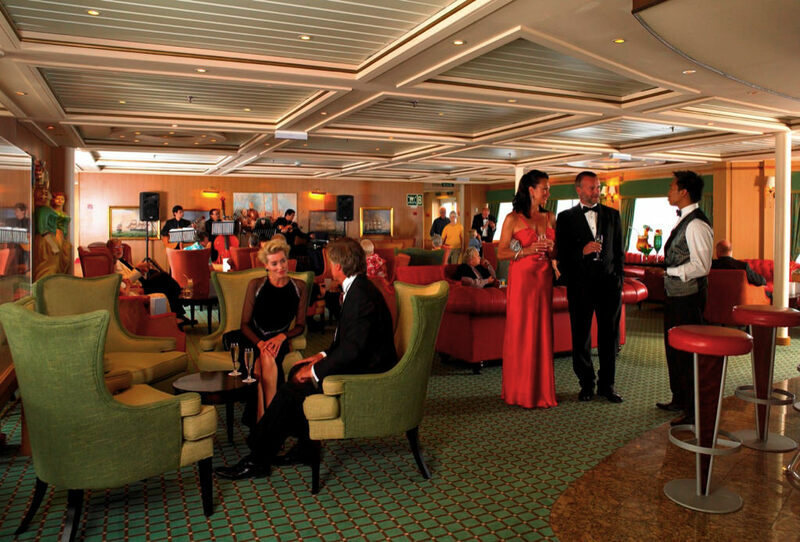 While onboard, guests have a multitude of options vying for their attention. Braemar features two formal restaurants in addition to the more casual Palms Café located on Lido Deck, 6, ensuring passengers never go hungry. She also boasts two show lounges, the Observatory Lounge overlooking the bow, a fully stocked library, two swimming pools, and the new Morning Light Pub just aft of the Neptune Lounge on Lounge Deck, 5. With her friendly crew of 371, Braemar carries guests to the Amazon, Baltics, Canary Islands, the Caribbean and the Mediterranean in the unique and relaxing atmosphere for which Fred. Olsen is known for. Stateroom categories E and I aboard Braemar can be booked on a male or female-share basis. 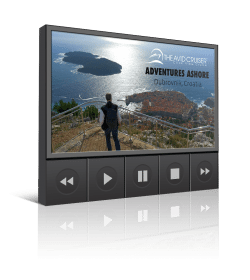 All staterooms are equipped with interactive televisions. Braemar boasts an impressive aft atrium, spanning five decks in height and featuring ocean views. 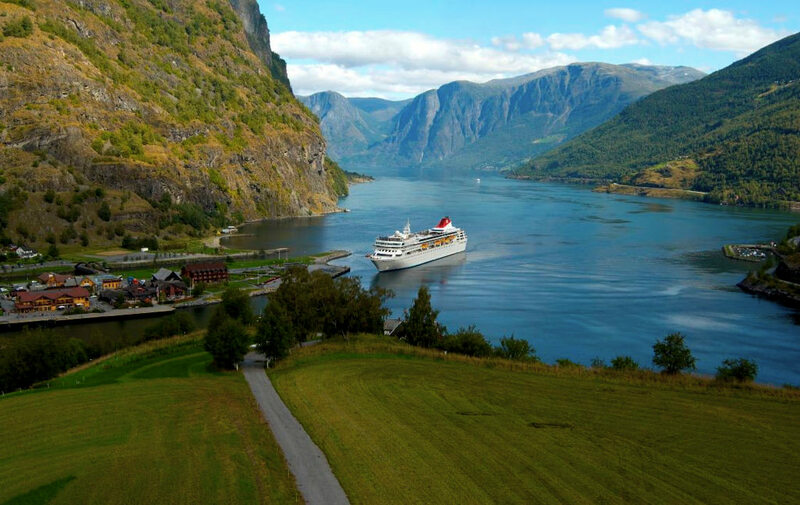 Long time cruisers may know Braemar by her former names: Crown Dynasty and Norwegian Dynasty.